Windstar Cruises’ Star Breeze began her life in 1989 as Seabourn Spirit, the second launch vessel for the then newly formed Seabourn Cruise Line. 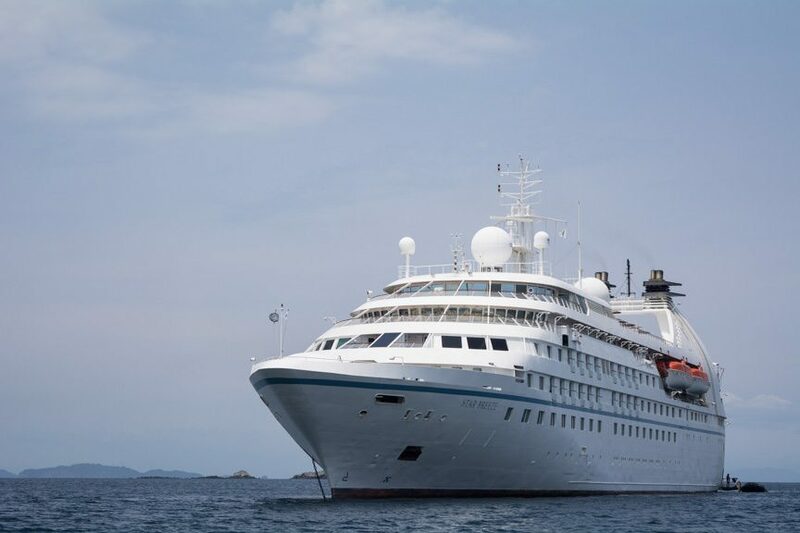 The sister to Seabourn Pride and, later, Seabourn Legend, Seabourn Spirit served Seabourn for well over 20 years. During that time, however, she was continually refitted. French balconies were added, as the ship’s original oceanview-only accommodations were falling out of style in the late 1990’s. Certain features were removed, while others were added. 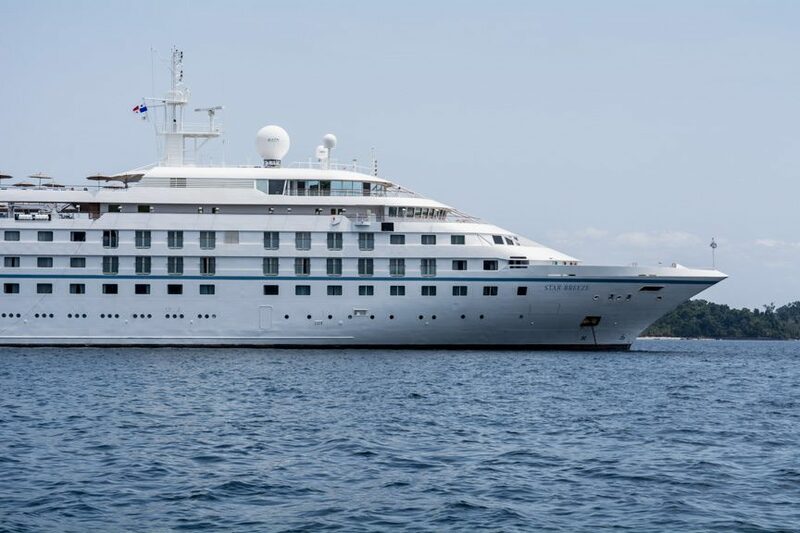 Seabourn Spirit, Seabourn Pride and Seabourn Legend were sold in bulk to Windstar Cruises, which acquired the three ships in 2014 and 2015, respectively. 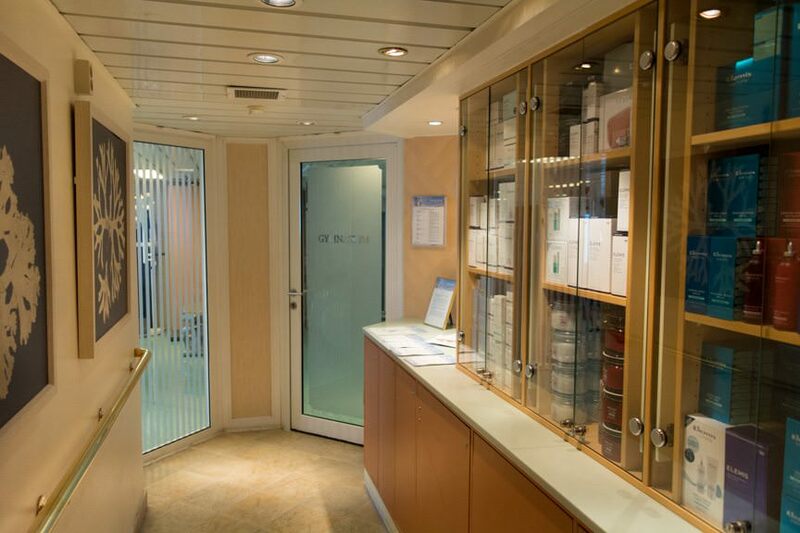 The latter two became Star Pride and Star Legend when they entered service for Windstar. 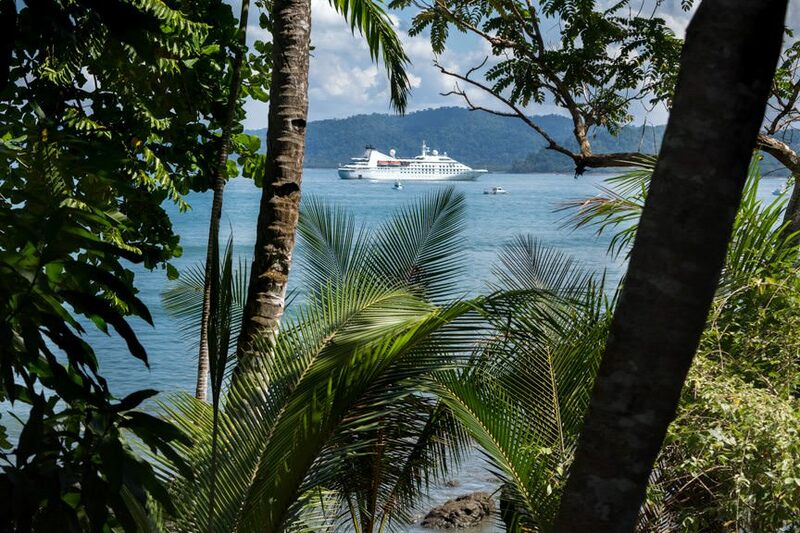 Recently refitted by Seabourn before their transfers, the ships did require Windstar to do much work to do to the public spaces and staterooms onboard – but the line chose to embark on a multi-million-dollar refitting campaign that would make each of these three vessels unmistakably Windstar. One feature that wasn’t removed were the ship’s retractable marina platforms mounted at the stern, which have been heavily copied ever since. This fits in perfectly with the Windstar mantra; each of the line’s existing three sail-motor ships includes a retractable marina. 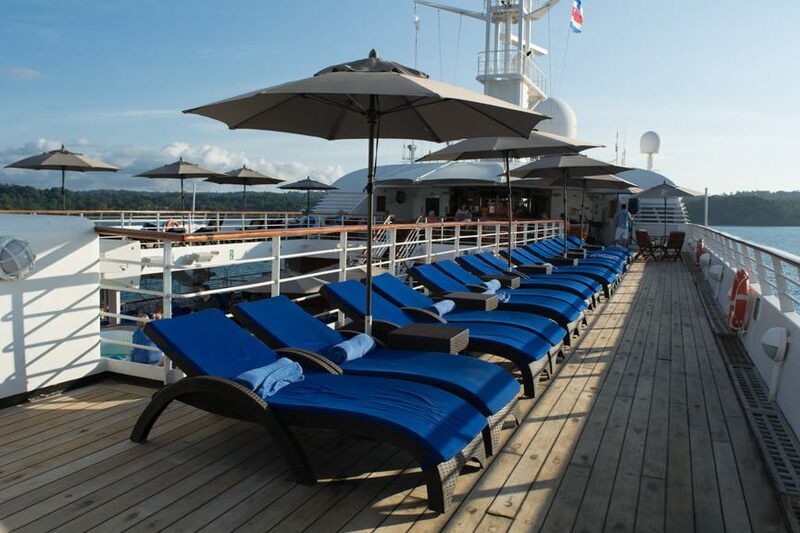 Capable of carrying just 212 guests, Star Breeze is one of Windstar Cruises most attractive and inviting ships. 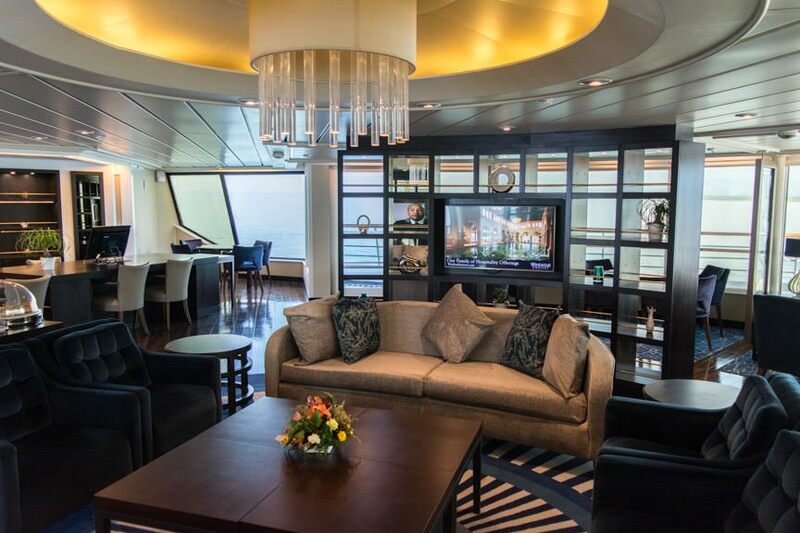 Thanks to her luxury pedigree, the vast majority of suites aboard Star Breeze come in at 277 square feet. These feel substantially larger still thanks to a great layout that includes a full seating area near the window complete with a plush couch on one side and two chairs and an end table on the other. In the center: an oversized coffee table. With three separate lighting options, this is the ultimate seaside reading nook. 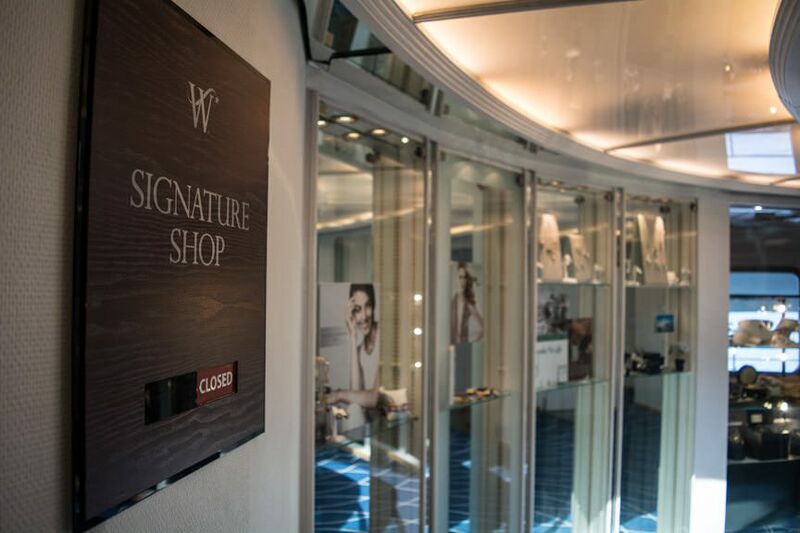 Windstar has made significant changes to suites onboard following the transfer of Star Breeze from Seabourn. New fabrics, furniture and soft furnishings have been added. 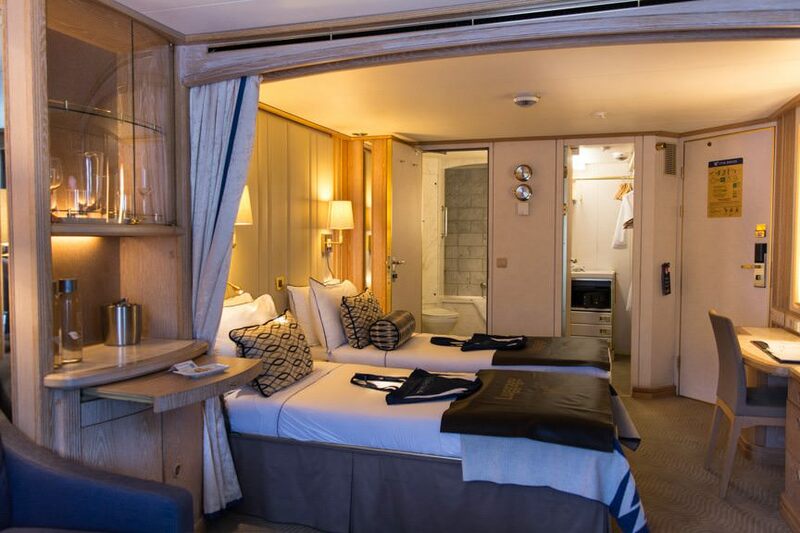 Windstar replaced the headboards, and added new direct and indirect light sources in the form of bedside lamps and reading lights. Carpets have been redone. Furniture is new. Drapes have been swapped out. In essence, you’d never know your suite is coming up on the anniversary of its third decade in service. 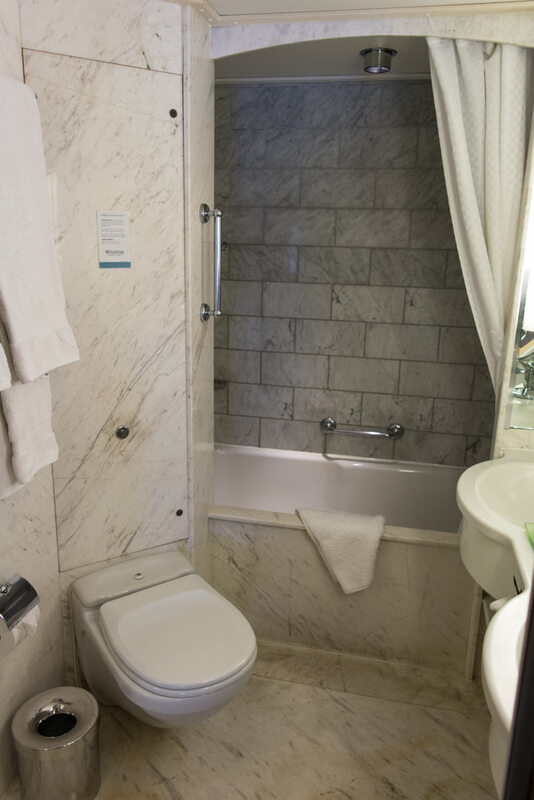 On the bathroom front, expect a spacious, marble-clad bathroom complete with a tub-shower combo and a dual vanity sink. 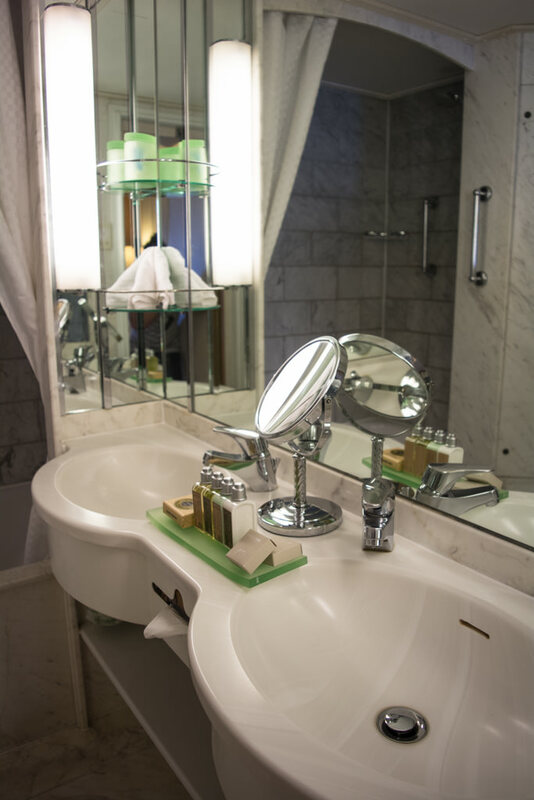 Shelves are available on either side of the vanity, with additional storage behind a mirrored glass panel located on the inside of the room opposite the sink and door. 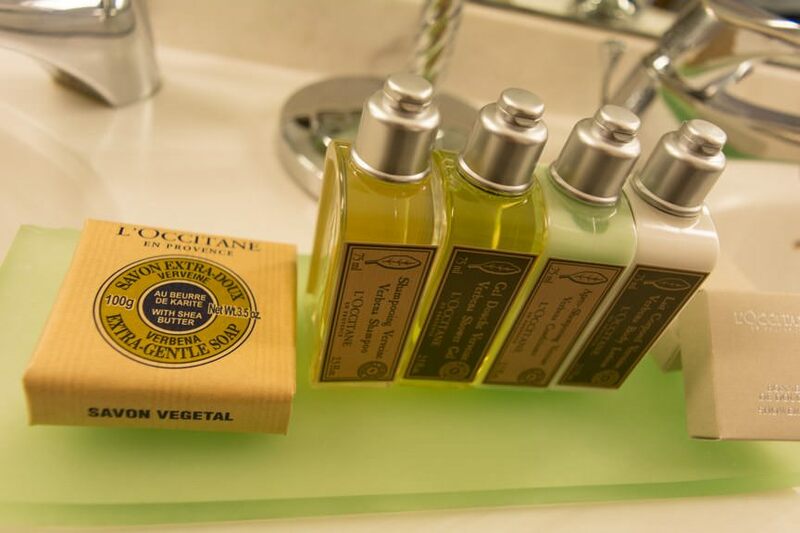 Toiletries are Windstar-standard: French-milled L’Occitane products grace the bathroom in every suite category. 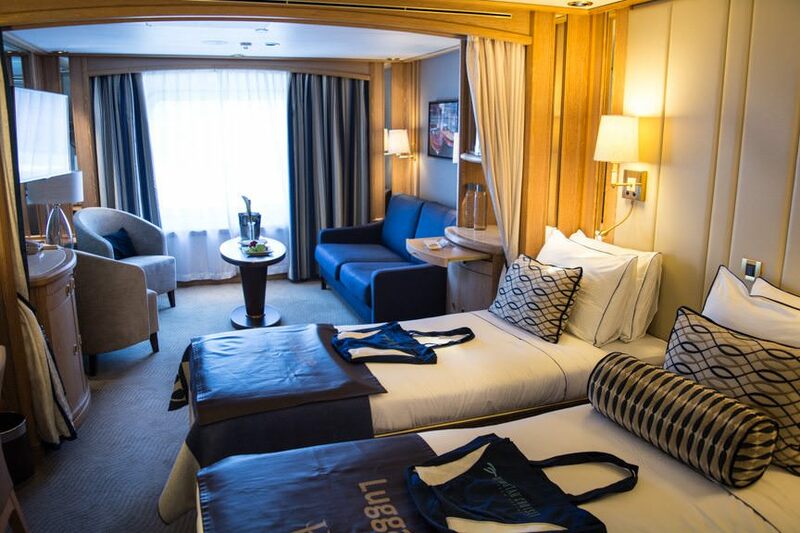 Star Breeze also offers two 575-square foot Owner’s Suites, and a handful of Classic Suites that range in size from 400 square feet to 530 square feet. 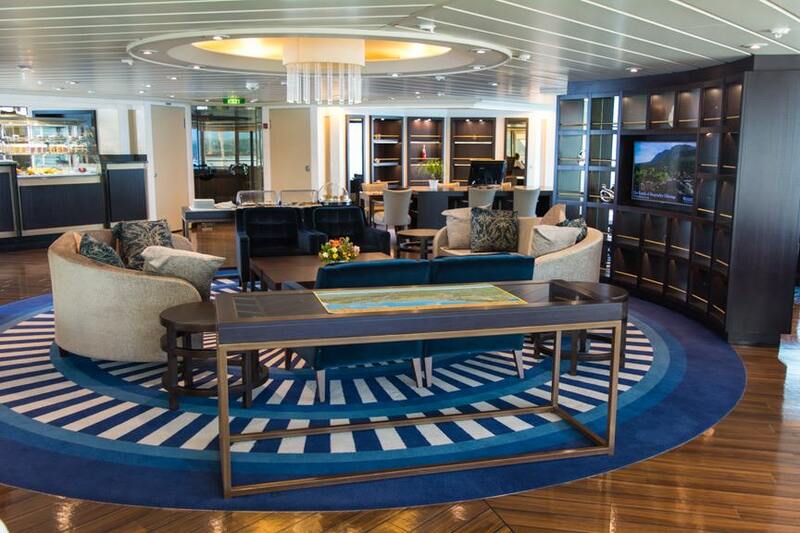 You’ll never have an issue finding a seat in your favorite public room aboard Star Breeze. 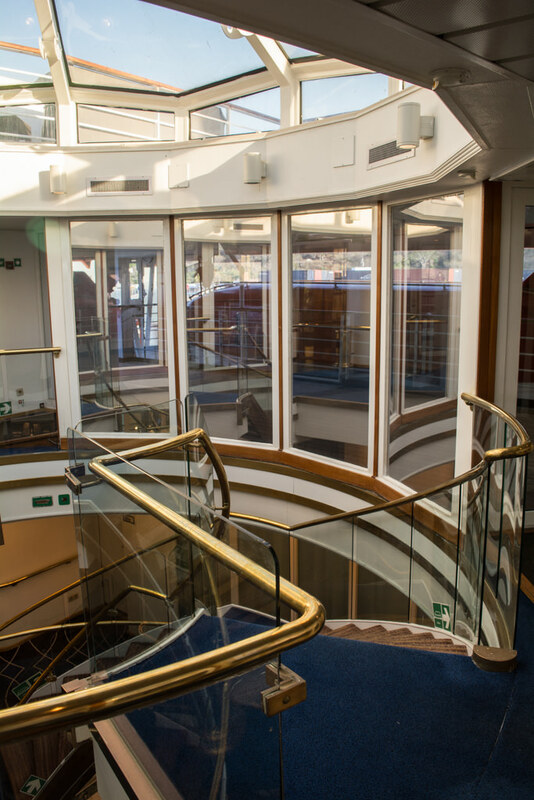 Anchored by an attractive Atrium that rises four decks in height, almost all public rooms are situated aft of the atrium, with the lone exception being the Yacht Club all the way forward on Deck 8. 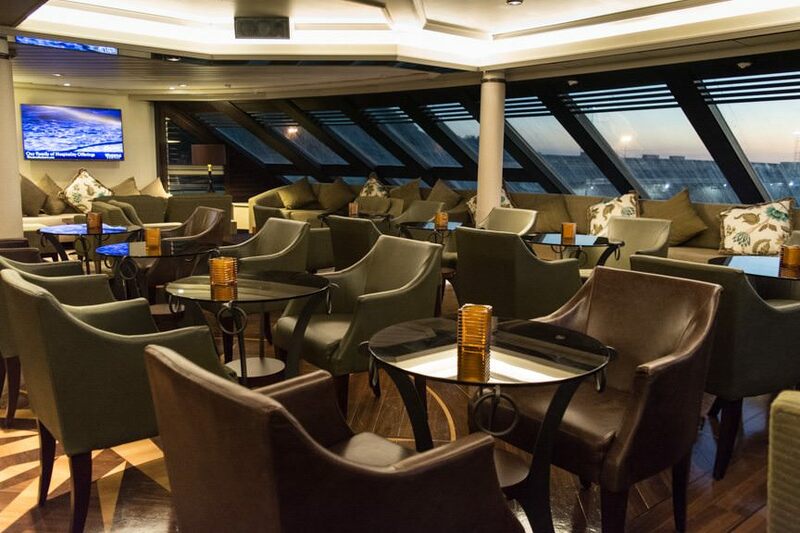 Dinners are typically taken in AmphorA, the main dining venue aboard Star Breeze. 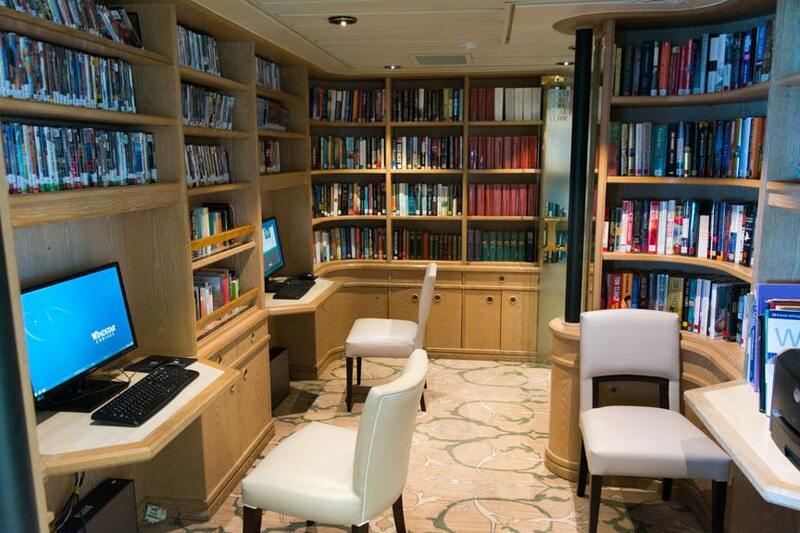 Situated on Deck 3, AmphorA has been attractively refitted from the ship’s Seabourn days, and is now one of the most inviting public rooms aboard the vessel. A good number of seating options are available, from intimate tables for two to larger ones that can seat six to eight guests. 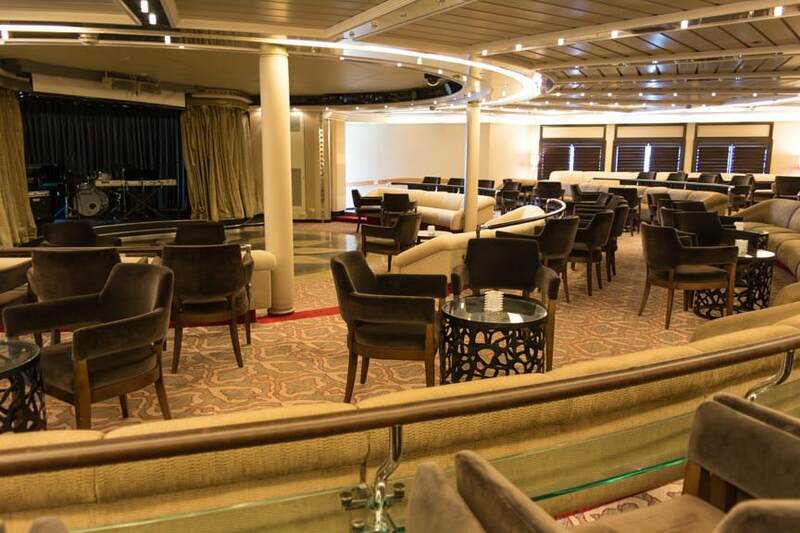 Casual meals are taken in The Veranda on Deck 7 aft, with buffet breakfast and buffet lunch being served here daily. 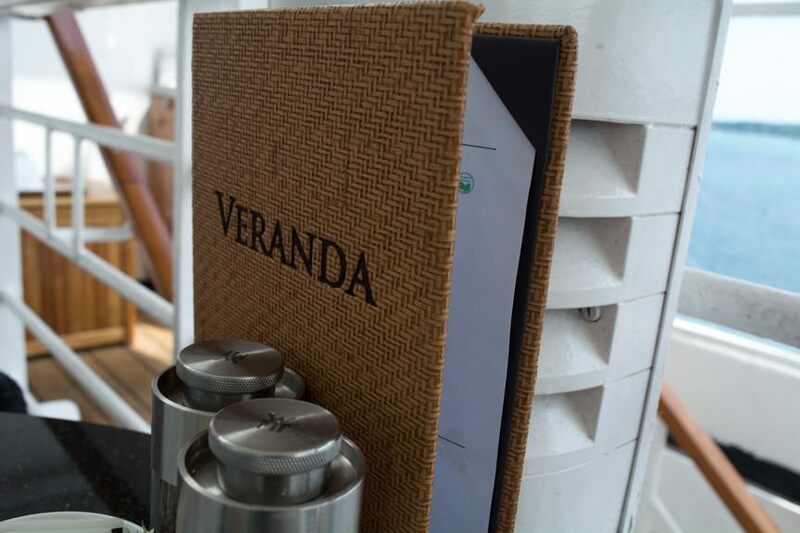 The Veranda also offers a selection of a la carte menu items available for order directly from your waiter. 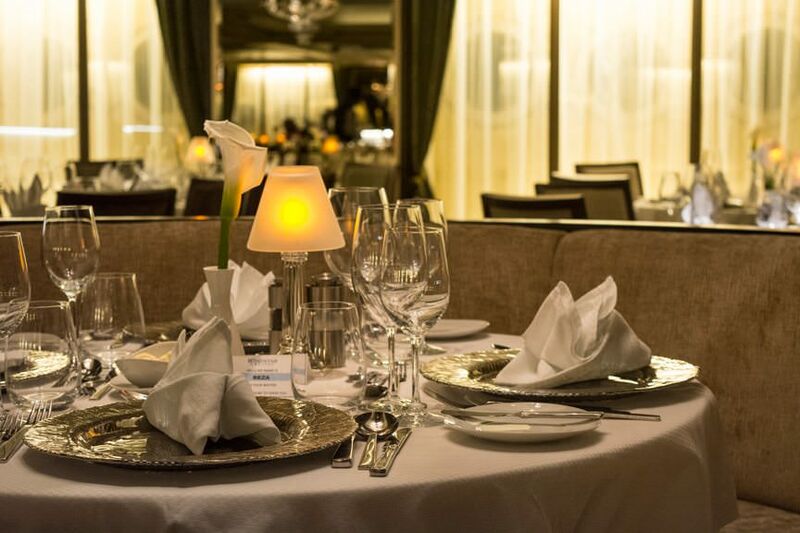 In the evening, The Veranda turns into Candles, Windstar Cruises intimate, reservations-only dining venue. 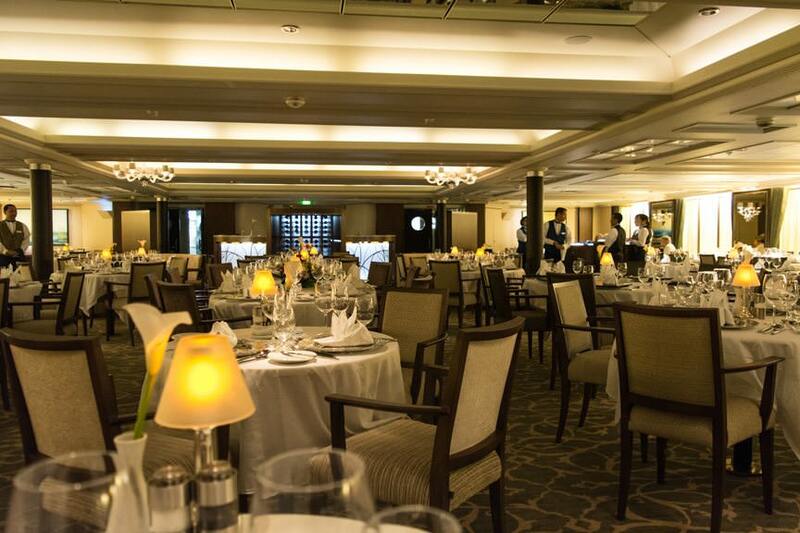 The atmosphere is intimate, with most guests dining outdoors on the stern of the ship, though indoor seating is also available. Reservations are required, but Candles is a complimentary dining venue. 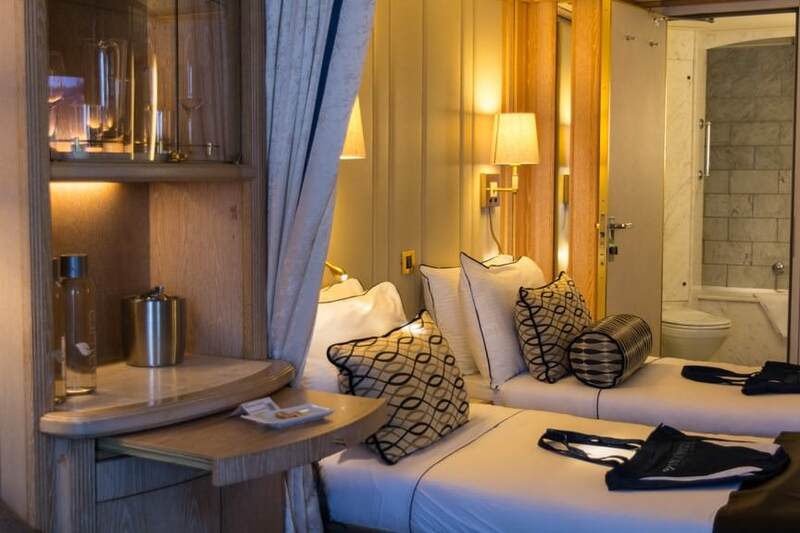 Continental breakfast, sandwiches, and other quick bites are available in the Yacht Club on Deck 8 forward, and canapes are served throughout the vessel, typically starting around 6 p.m.
Room Service is also available to all guests. 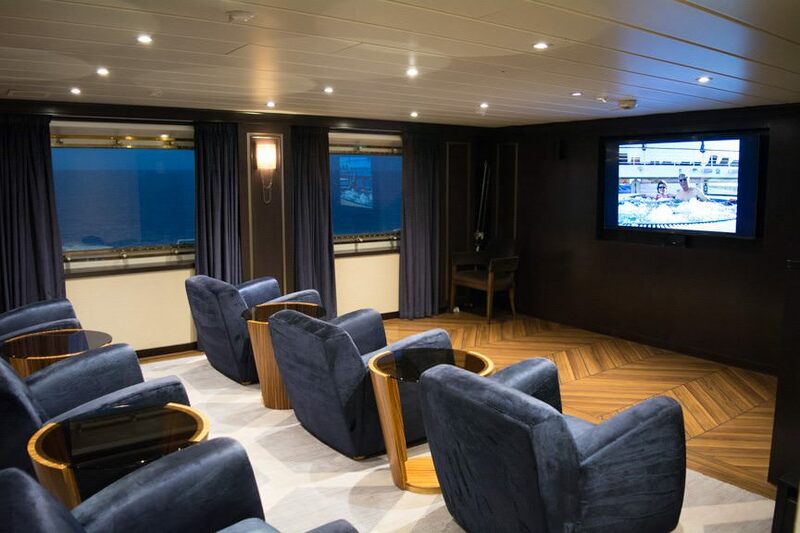 The latter basically allows you to have unlimited internet access throughout the vessel for the duration of the voyage. If you’ve sailed with Windstar before, you’ll know the act of setting sail is no ordinary departure: On Windstar, it’s a true event, accompanied by the raising of the sails to the thudding Vangelis score from the film 1492: Conquest of Paradise. There’s just one problem: Star Breeze has no sails. 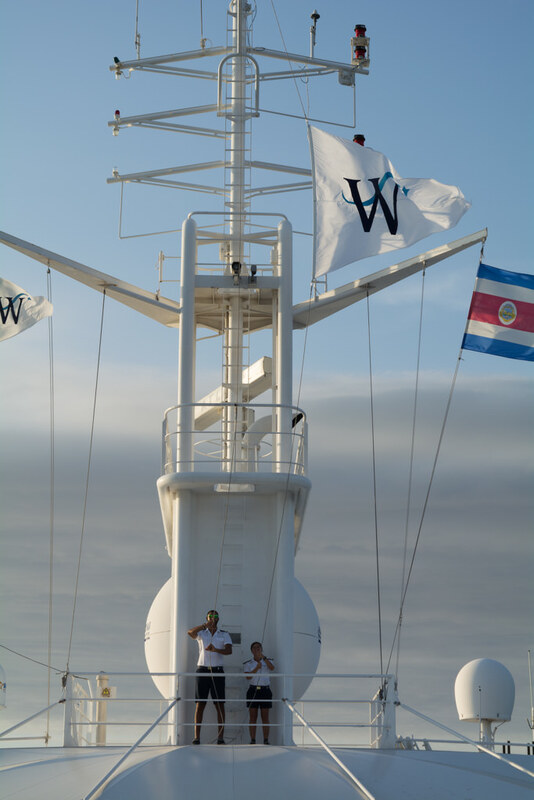 Windstar thought of that, and solved the problem with a special flag raising ceremony that takes place on the forward radar mast just above the Star Bar on Deck 8. With the score to Conquest of Paradise playing over the ship’s new sound system, guests gather in the fluorescent glow of the lights and watch in awe as two crew members appeared beside the forward mast, raising the Windstar Cruises house flag up to the crest of the musical score. It’s not as impactful as watching the sails billow out on Windstar’s sailing ships, but it’s nice to see Windstar made the effort to carry on that tradition aboard its Power Yachts. Star Breeze currently spends her winters in Costa Rica and Panama, with summers in the Eastern and Western Mediterranean. She also offers Transatlantic Crossings between Europe and North America seasonally, and the occasional Caribbean cruise as well. Windstar recommends US$12 per guest, per day, which can be added to your onboard account and settled with cash or credit card. 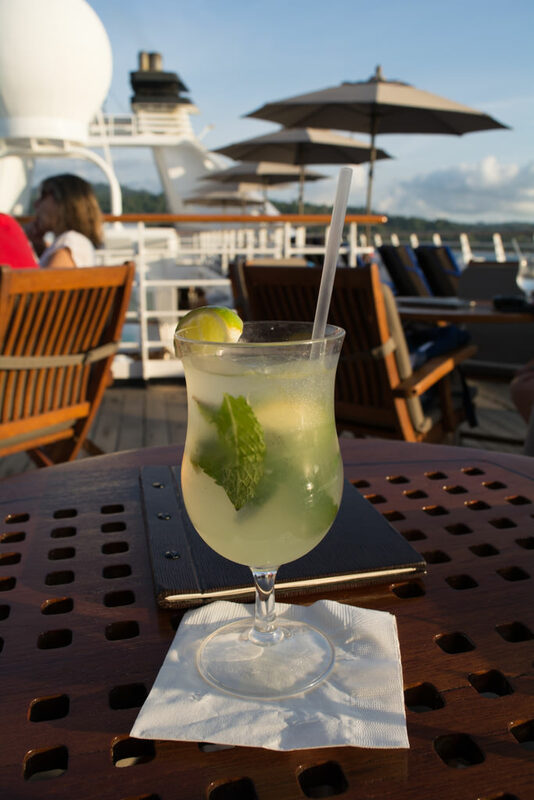 Though Windstar is not all-inclusive, Star Breeze has beverage packages available for US$100 per stateroom. 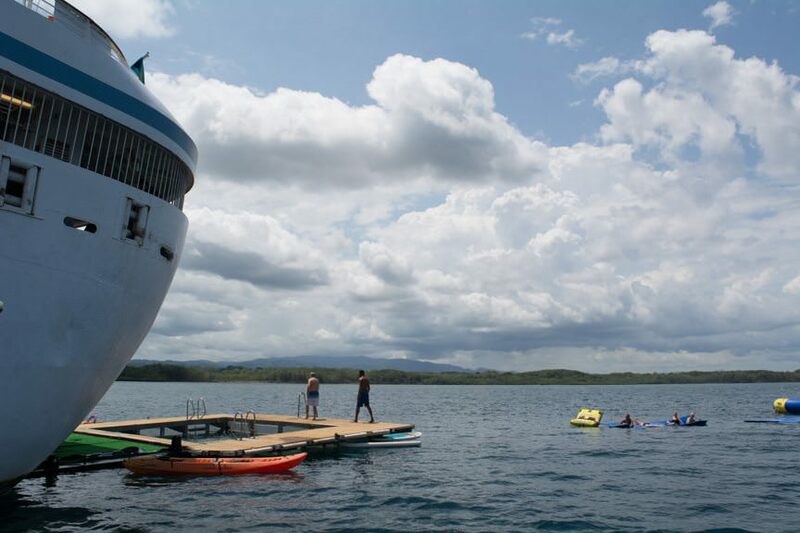 Want Help With Your Windstar Cruise? Complete the form for special savings or added perks that I may be able to obtain from Avid Cruiser's travel partners. Please choose only one for now. We can chat later about other destinations. 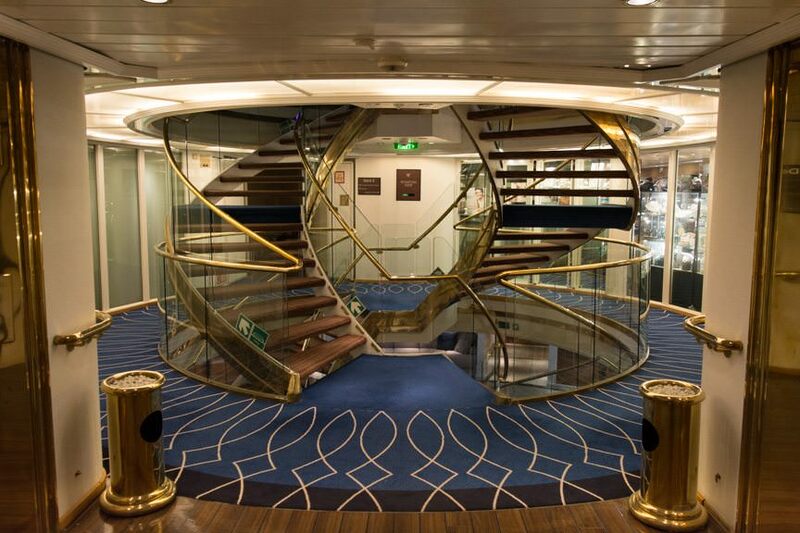 When Would You Like To Cruise? Do You Have A Travel Agent? If you're able to provide your travel agent's contact info, I may be able to work with him or her to recommend a cruise that is best for you. By submitting your contact information, you agree that your email address may be shared either directly with the cruise company or with a travel expert who can help me find savings and/or added perks for you. Talk To Me! Anything else you'd like to tell me that can help me help you?